Episode 3 of Top Chef Kentucky checks back in with two chefs on opposite sides of the emotional spectrum. On one side, we have Nini, last week’s Elimination Challenge winner, who’s $10,000 richer as a result. On the other, we have Eddie, who’s still dealing with the guilt of having monopolized one-third of his team’s budget in the Elimination Challenge, thus indirectly leading to Nathalie getting cut. That guilt, he predicts, is going to last a while. But what better way to forget about one’s sins than with a holiday-themed Quickfire challenge? The Top Chef kitchen is all decked out (with bows of holly?) for our chefs, who enter to find Padma standing next to former Top Chef-winners Richard Blais and Brooke Williamson wearing the requisite ugly sweater. We all know this is a total fiction and that this must have been filmed sometime in the sweltering Kentucky summer—anyone remember the oppressive Kentucky heat from just last episode, which melted Nathalie’s lemon curd? But I digress. Padma lays out the rules: the chefs will have two minutes in which to select ingredients from the pantry and put them into each of their Christmas-decorated boxes. The chefs will then have 30 minutes in which to cook a dish using only the ingredients in those boxes. Thus, they’re going to have to get everything they need in those short two minutes. When it’s go-time, the chefs race to grab their box and then book it over to the pantry. It’s like Black Friday, with chefs grabbing items, dumping them into their boxes, and basically looting the place. It’s a total mess and quite chaotic—multiple bottles of random ingredients shatter on the floor as chefs scurry from one station to the next, sometimes without any thought process behind their selections. For example, Kevin grabs five different types of flour without any apparent purpose. After the two minutes are up, Padma announces the twist: there’s now going to be the traditional Christmas white elephant gift exchange. That means that no one will get to cook with the ingredients they actually selected—rather, those ingredients are going to form the basis of someone else’s dish, for good or for worse. The chefs draw knives for their order and then either select one of the boxes put together by a felloe cheftestant, or can steal an already-selected box from someone else. It’s a relatively cordial and lighthearted affair—David is thrice deprived of the box he selects, everyone laughs at Justin’s predicament of having to figure out how to use any of the five types of flour Kevin grabbed, Nini laments having no protein in the box that Sara put together . . . in the end, only about half of the chefs are happy with what they ended up with. 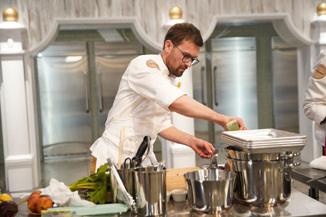 But that’s the name of the game on Top Chef, and luckily, the results are not bad at all. There are a few dishes that have a couple of problems—Eddie didn’t make good use of Nini’s box, with a curry that had muddled flavors, Justin’s kimchi meatloaf was simply too salty, and Kelsey admittedly had a tough (holiday) challenge with all the spring ingredients in her box, but the judges don’t feel like she was successful enough in executing her attempt at making a play on bacon-wrapped asparagus. Sarah, David, and Nini get better news. The judges really liked Sara’s play on chopped liver, which incorporated fried chicken and had lots of flavor. David was brilliant at making a leek carbonara where the leeks substituted for noodles in the dish. And Nini’s use of her box ingredients to make a cream cheese pepper jelly with apples was sheer genius. In the end, David takes home Quickfire win #2 and gets immunity. In a surprising show of generosity, Padma promises them the rest of the day off and invites to return home, where there’s a “real present waiting for them.” The present turns out to be the fact that the Top Chef house has been beautifully decorated for “Christmas” and they have an amazing Christmas meal prepared for them by Tom and Graham. To make things even better, Eric Ripert from Le Bernadain will be joining them. A lot of culinary fanboy-ing and fangirl-ing commences.